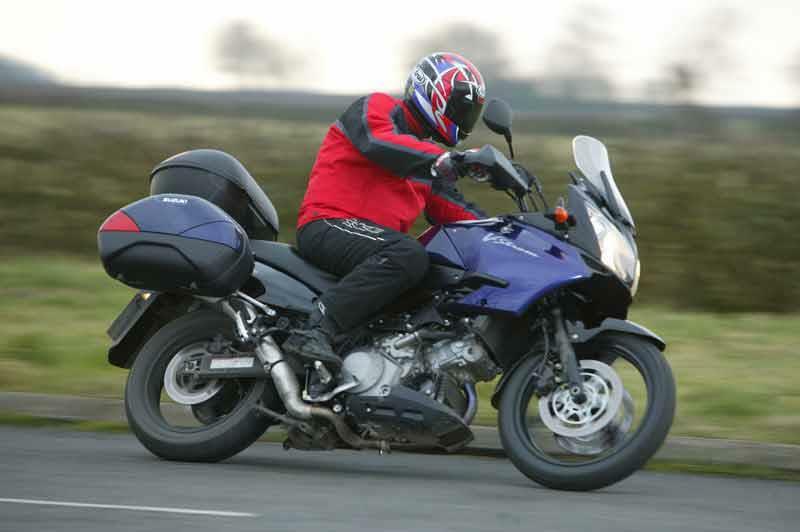 The Suzuki DL1000 V-Strom is a far better bike than its subdued manner and slightly anonymous styling suggests. It’s heart is the excellent V-twin motor from the TL series. 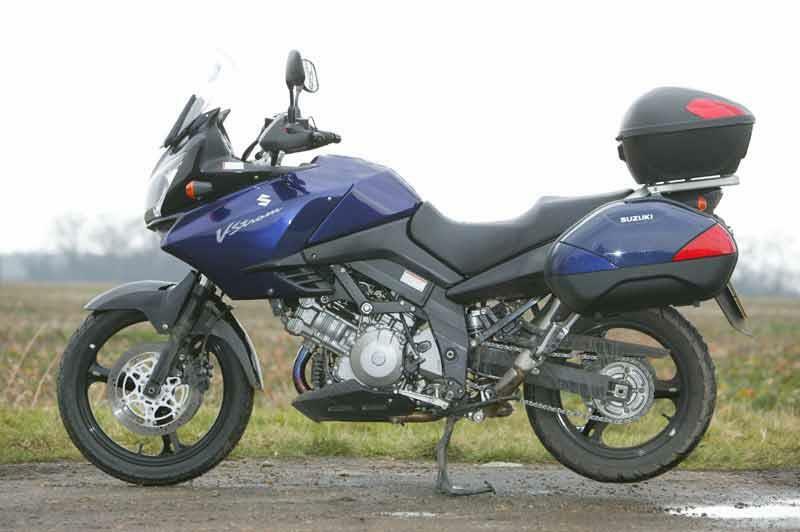 The Suzuki DL1000 V-Strom's chassis is top notch road-trailie, it’s comfortable, brisk and excellent value, too. 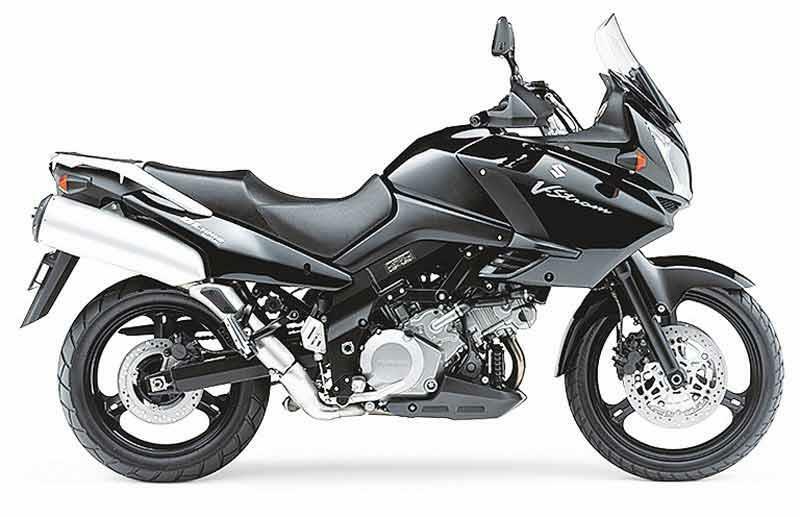 The Suzuki DL1000 V-Strom's wide, high bars and low pegs have you adopting a sit up and beg posture that makes comfortable sense in the long run. 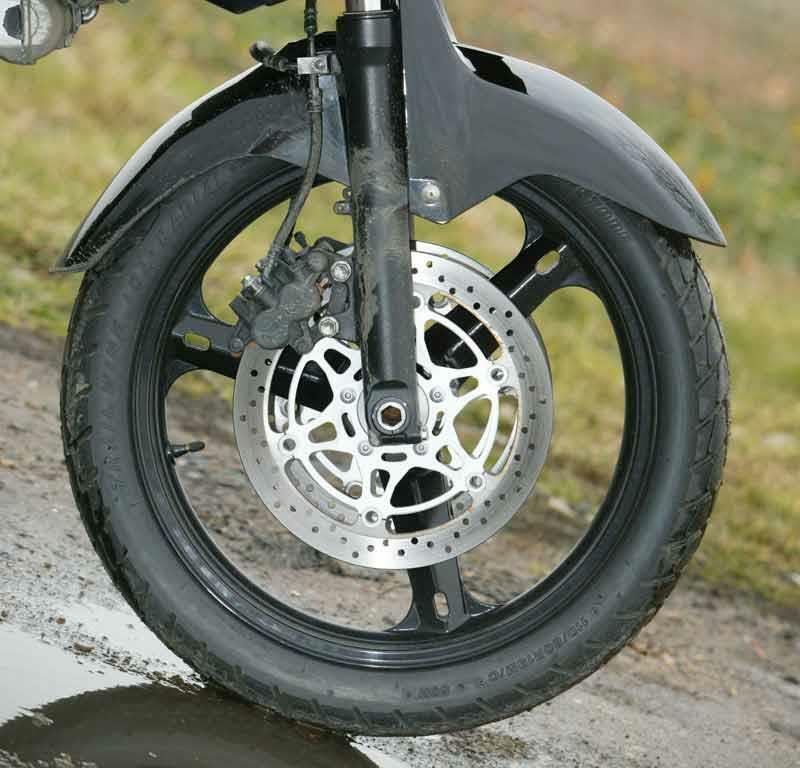 The suspension is plush to soak the bumps and ruts of British roads easing your ride. 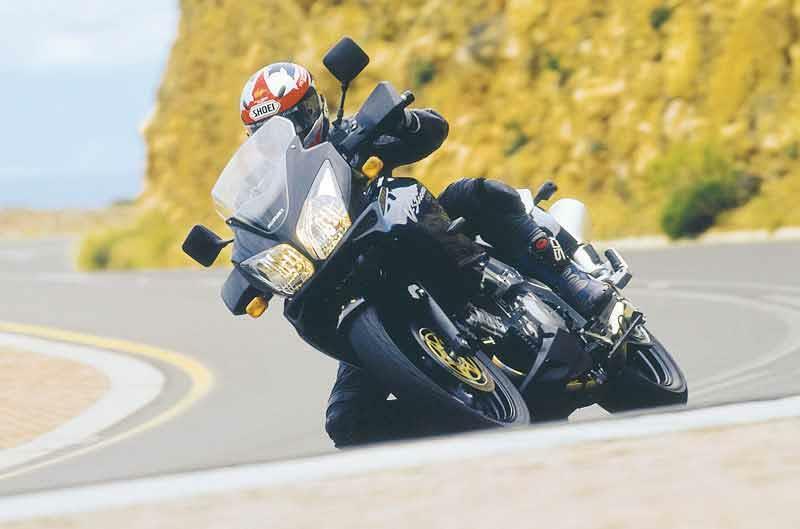 That plush suspension can mean the Suzuki DL1000 V-Strom wallows a little, but only if you tackle twisties in the way you would on a more dedicated sportsbike. 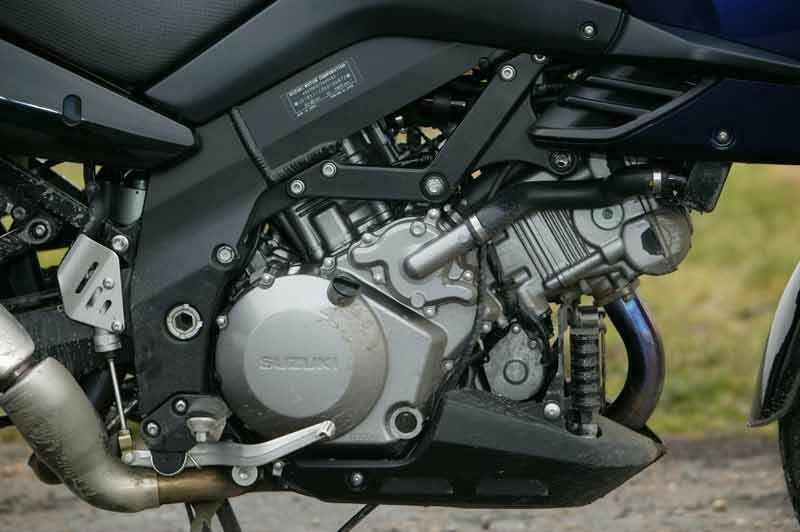 The Suzuki DL1000 V-Strom is the acceptable face of the old TL1000 motor. Detuned for greater low-down grunt the Suzuki DL1000 V-Strom will drive you hard out of corners or past caravans on long distance jaunts. And apart from the glorious noise, you would be hard-pushed to recognise that the Suzuki DL1000 V-Strom is a V-twin, it's that vibe-free. 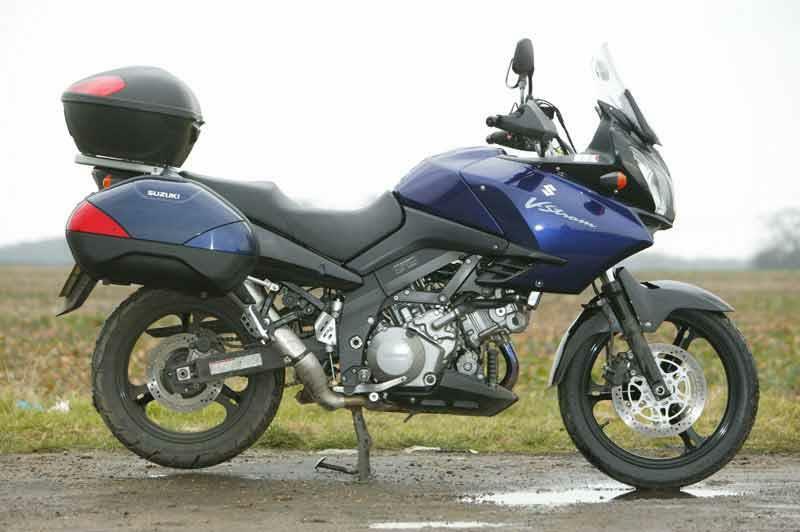 The Suzuki DL1000 V-Strom is not quite the luxury item that a BMW GS or KTM Adventure professes to be, but although more workmanlike it’s fairly decent, robust and reliable. Look after your Suzuki DL1000 V-Strom and keep it clean in all the right areas and you won’t regret it. There’s no getting away with it, with the Suzuki DL1000 V-Strom, you get an awful lot of bike for your buck. Lots of extra such as heated grips, luggage and centre stands are available too making the Suzuki DL1000 V-Strom a true go-anywhere motorcycle for not a huge amount of dosh. Find a Suzuki DL1000 V-Strom for sale. 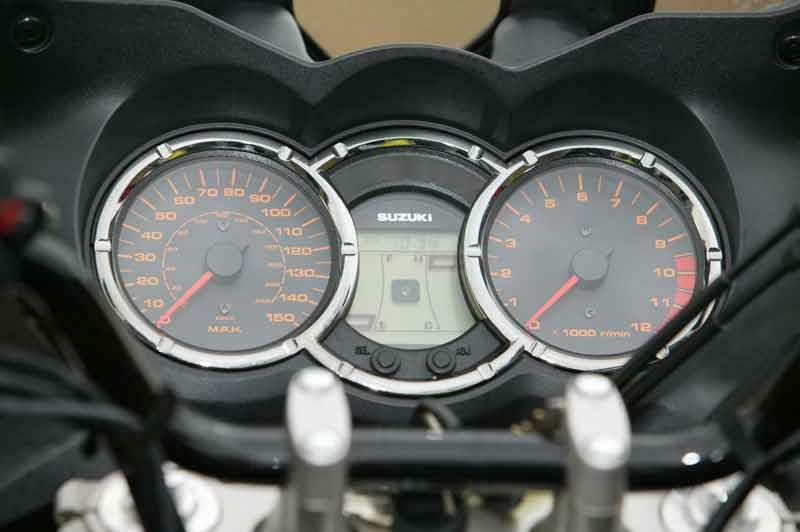 The Suzuki DL1000 V-Strom dash is well equipped with digital fuel gauge, clock, rev counter and all the other usuals and the mirrors work very well, offering a big, clear view of the scene behind. 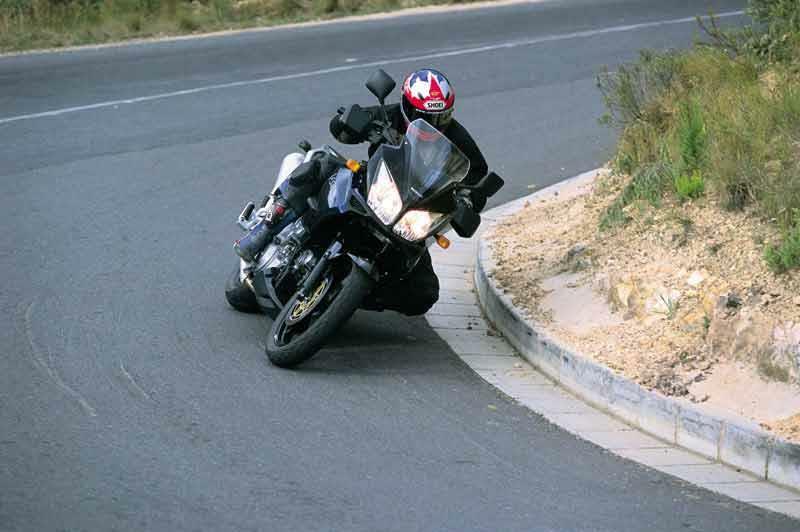 Some may find the Suzuki DL1000 V-Strom screen a tad low for high-speed work, but that can be sorted with a flip-up, or some leaning forward when you want to whip along at three-figure speeds (overseas, obviously). 2002: Suzuki DL1000 V-Strom introduced. Suzuki DL1000 V-Strom Grand Touring. 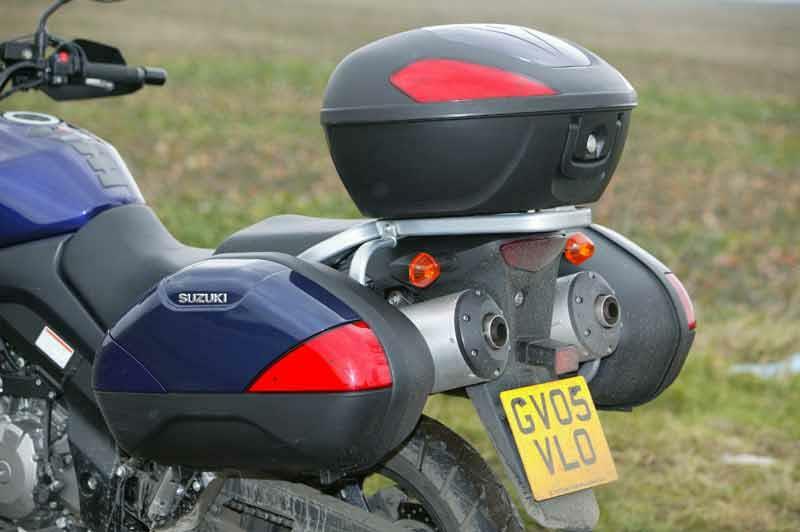 Introduced in 2006 with heated grips, centre stand and luggage pack as standard fitments. 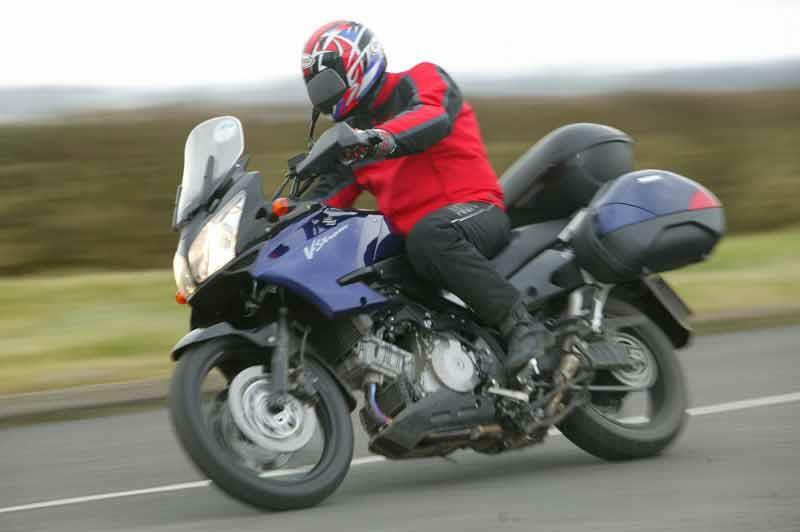 22 owners have reviewed their SUZUKI DL1000 V-STROM (2002-2008) and rated it in a number of areas. Read what they have to say and what they like and dislike about the bike below. Amazing to ride, breaks smoothly and it gives you more than you would expect from a low budget motorbike. I bought it from a dealer with 48000km for 3500€. Excellent condition. So far, so good... Over 70k miles covered. It's a reliable bike, I bought it used but I don't regret it. It's quite thirsty. I think the twin exhausts are a cool feature. Touring side is nice and you can hit some light off-road. 19 inch wheel. Of course it's not as comfy as a GS or KTM. Gel or replace the seat. Power is always there but after 3000rpm...nice V-twin sound. Build quality is ok. Sometimes the gears skip and without an indicator you get confused. If hitting the trails then you must add crash bars and other protection. A centre stand would be nice. The upright riding position is very comfortable but the stock seat has to go. It's hard to tell that you're not on a sport bike when you hit the twisters. Great bike overall. Rides great. Very comfortable and the brakes work great. Mine doesn't have ABS, which will be a requirement on the next one. Crazy powerful and a ton of torque. No complaints. Very easy to work on once you've learned to tear it down. The only issue I have is the notorious clutch basket rattle at around 3000 RPM. 50,000 miles and it hasn't hurt anything. Just noisy. Tons of goodies available for the DL1000. Engine guard, a throttle lock, and hard panniers are a must. very impress except to ride slow, have to play the clutch in trails so engine does not go below 3000 I will change the sprockets to 16-43. Stock it's an ok bike - suspension average at best, decent motor, excellent ergos and weather protection. With a PC & dyno Tune, opened up airbox, Remus cans it barks & runs much better (97 HP). Racetech fork springs, and revalved fork, Penske shock, lowered front by 1.5", raised rear 1 1/4", it's no GSXR but handles extremely well. The long seat to peg distance makes it very comfortale, but a bit top heavy. Great value if you know how to make the right mods. It is but ugly, but I bought it to ride, not look at. Mine will hang with any other adventure bike until the road turns turns to goat trail. Beautiful from some angles,and as ugly as big Hilda from the chippy from other angles, very few people know what to make of the big DL, unless they've owned one. It lacks glamour and focus but once you've had one, they'll always hold a place in your heart. It looks massive but is infact light and agile, weighing less than a Honda 800 Vfr. A big tank, comfy seat, bullet proof punchy engine,and good weather protection are a few of its good points. Aftermarket is easy and I recommend: progressive front springs, hyperpro rear suspension, Renthall fatbars, Oxford heated grips, Leo Vince/two Bros exhausts, Givi crash bars, Givi panniers and backbox. Poor bouncy suspension and poor brakes are its main faults but curable. So if you want a bike that is almost as good as a GS but at a fraction of the price and you can ignore some questionable styling and a few budget parts, this is a fantastic buy. 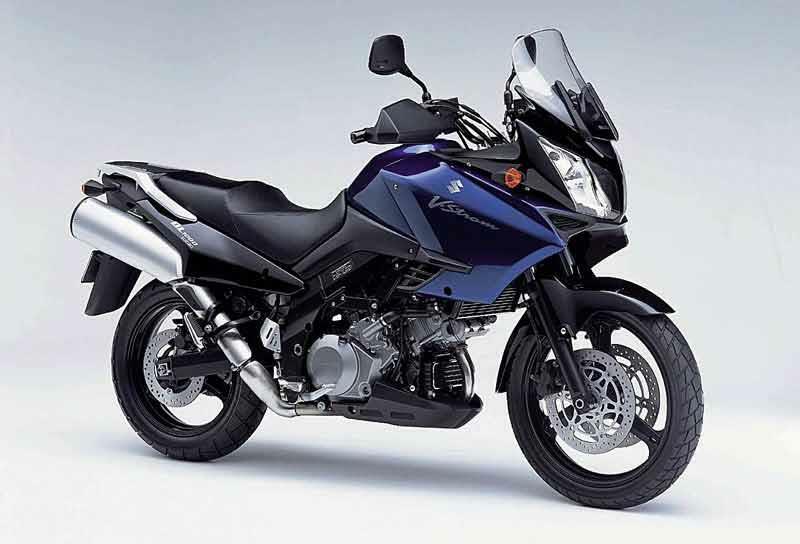 Suzuki describe it as a dual purpose sports tourer and it is. Gravel, highway, commute, tour, racetrack, one up, two up, it does it all and pretty well indeed. If you think that you might get one, then get one, you won't regret it. Why is the ugly BMW GS the benchmark for big trailies? Don't get me wrong its great to ride, solid, powerful, great handling and mature; but with the boxer that gets in the way or demaged with serious greenlaning, horried looks, stupid switchgear.... what is it about it? And why does nobody even mentions the V-Strom as a competitor? I can only guess - because it worries the competition. It is simply the best of all: Tiger, to heavy unreliable and useless for even gravel, Varadero an expensive softy with no soul, Aprillia not really a serious contender, KTM ugly as pig (which is why most are orange...), less reliable and more expensive than the V-strom. After a few month of Immobilizer related problems that proved a challenge to get right, I finally enjoyed hundreds of miles of mixed british roads: A,B and M. Even some green laning. In the sun, rain and frost. The V-Strom is so easy to live with. It easily keeps up with 'hard working, sport bikers on smoot A-roads, copes brilliantly with the poorer roads of the yorkshire dales and is almost as comfy as a tourer on the motorways. so why does it get so little recognition? shame it's discontinued too. Let's hope a new version, just as good, comes out again. I'll cercainly buy one. I bought mine new in July '07. I began taking trips the following week, it was broken in within a week and ready for first service. I put a Suzuki gel seat on when I bought it, never have sat on the original. Also bought bar risers to come up and back a couple inches both ways. It's fairly comfortable for 2-3 hours, need to stretch a bit after that. I often ride to Central Oregon, a 4 hour(less at times) trip to where I go. Stop about half way for gas and bathroom, I'm good the rest of the way. Not a pro at all, but love to corner, it does quite well except if it's wet and you corner on cross walk paint or railroad tracks, hops a bit sideways if you don't slow way down. Only real issue I've had, when it was about 10 months or so old, about 8,000 miles, it started running badly at steady speeds unless I revved it quite a bit. Barely got it too the dealer, they changed plugs but couldn't duplicate the problem. Ran good for a while, then did same thing a couple of times, though not as bad as first time. Again, really couldn't find it, though they suspect factory lean settings at lower revs, supposed to be a fix for that, new chip or something. Other than that, really nothing wrong, been a mostly very good bike and a good buy I thought. Love the torque available, and if you kick down a gear to pass on a 2 lane road, pulls very hard to 90-100mph very fast. The test says top speed of 130, I've had mine to 130-135 several times and still more to go, dealer says 150 and I bet it's close. All in all, avery good bike and I've met many people that have 650's and 1000's and they are generall y very pleased with them. I have an 03 with 80,000 km. During the past five years the only problem has been a leaking slave cylinder --however routine cleaning keeps this under control. The Strom is a great bike, among the very best purchases I have made in my life. The engine has great torque, the clutch on 03 is flawless. I am 5'8" so I do find the bike a bit top heavy, especially when stationary --getting it upright off the kick stand, or in the garage. Over time you get used to it, but with a full tank of gas, you need to be careful at very low speeds. after 5 years of riding a bandit600, when it came to upgrade, this was the only bike that fit the budget, me (6'4"), my requirements. the engine is stunning, and pulls effortlessly. the looks - although not to everyones taste, are suitable "rugged" i think, its not a panzer wagon, and its 'off road' ability is definately a second priority. if you are looking for an excellant all round fun to use, eurotourer, commuter, workhorse, this is the bike that gets constantly over looked, its like the new tiger, but less, its like the varadero, but less (and less ugly), its way less than the sports tourers, less than the panzer......allround excellant. Having hired BMW enduro bikes I was looking for a cheaper alternative. I tried the Honda Valadero, looked at the Triumph Tiger but once I had once seen the V-strom for the first time I went for it. It only needed a very short test ride to confirm my initial good feeling about it. The V-strom has phantastic, honest, non discript (some may say boring) looks. It's symmetrical, (dials, headlamps, exhausts), non aggressive down to earth and supptle. Mine was fitted with the paniers which I ended up using much more than I thought I would. since bying it in June I covered 2.500 miles, with and without my girl, traveling, urban fun, mountain roads and even a little off road. The latter is the only area it can not match the BMW! Else it is much more comfy, easy to control, powerful enough and great fun. And the sound is again fitting the caracter: relaxed, understated yet powerful, underlining the great character of this bike. Let's hope durabilty on my 2 year old bike will never be an issue (until now I had zero troubles) Highly recommended bike!! Back to biking after several years i bought a GS500 to see if its still there, i then got the want's, I tried a few tourers from the showroom including the Honda Varadero?, but the V strom kept winking at me! One good ride and I was hooked I've had her 5 months and just got back from a 1100 mile trip around scotland, two up with her in doors and all the bags and boxes. Avr 44mpg, no problem with the bike, the front screen did the job but when dirty and raining, visibility was hard work, blow 60mph I had to drop out of overdrive (6th) to pull away quickly but as you know its not a problem, all round great bike. Lean forward for fun or arms stretched for crusing. Went to this from a GSXF750 - not the most extreme seating position, but still not comfy for 6' me! Test rode a Bandit 1250 at Crescent and didn't like it, they threw me the keys of a V-Strom and the test ride was a revalation! The handling was execellent - wide bars mean you can flick it around, seating postion just right, screen good etc. Love the v-twin, can't wait to get through the running in now I've bought one! Swapped by Tiger for a VStrom last year. Love it! Better handling,especially high-speed cruising on m-ways! Engine bit lumpy at first but now much smoother with plenty of torque. Great for 2-up touring and fantastic value for money. I bought my Yellow Wasp in December 2005 for 4,700 s/h with 484 miles on the clock. Both Pilot and Pillion comfort, sound of the Engine, all round view. Weaknesses: Wind buffeting. Tendancy to cut out when slowing down. Moved to OZ from UK, Brought the DL1000 new for $13.000 (5.900 GBP) Incl Sat- Nav, & 41L Top Box. Just done my 1st ride on it. (150kms)What a bike! Far exceeds my bikes I had in the UK (Triumph Sprint & Blackbird) in terms of comfort. Riding position is 100%. Bit wary at first taking sharp bends (plenty here) not a worry, went through with ease with not a hint of trouble. Having no trouble with wind buffering head on or side. Adjustable screen on 06 models here. Same in UK? Strengths: Comfort is suberb. Handling is brilliant.bullet proof engine. Mid range power. 6th gear (overdrive). Handy here where most roads are straight. Weaknesses: Brand new bike. Not run in yet so not found any. Watch this space though! Bad wind buffeting at high speed. Poor rear brake. Bought this in early 03 to get off sportier machinery and it fit the bill beautifully. Last summer I took it off to Italy, spending 10 days all over the Alps with Givi 52l. Top box, bedding roll, tent and Streetpilot 3 to show me the way. It handled everything from 650 mile autoroute days (London to the far side of Lake Geneva) to the twistiest hairpin roads with amazing composure. Strengths: Flexibility, midrange grunt, view. Weaknesses: Saggy back end needs raising and firming. Friendly, forgiving, and kind on your pocket.